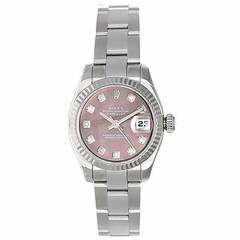 Rolex Datejust Ladies 2-Tone Mother of Pearl Diamond Dial 79173 - Automatic winding, Quickset, 31 jewels, sapphire crystal. 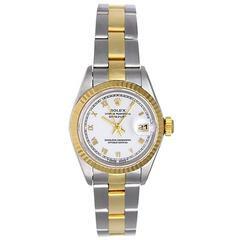 Stainless steel case with 18k yellow gold fluted bezel ( 26 mm ). Factory Tahitian Mother of Pearl with Diamond hour markers. Stainless steel and 18k yellow gold Jubilee bracelet. Pre-owned with Rolex box and books. Rolex Datejust Reference #:69190. . Verified and Certified by WatchFacts. 1 year warranty offered by WatchFacts. Rolex Datejust Reference #:69180. . Verified and Certified by WatchFacts. 1 year warranty offered by WatchFacts.